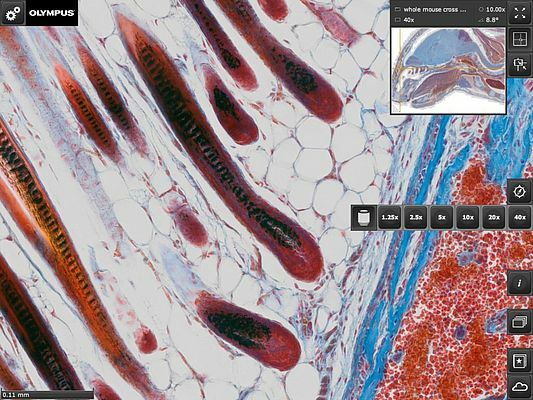 Researchers and educators are now able to access their entire library of virtual microscope images with just a tap of the finger on the OlyVIA Mobile iPad App. Free to download from the iTunes App Store, the app is designed for images captured with the Olympus VS120 virtual slide scanning system. Images shared via the Olympus Net Image ServerSQL v.2.7 software can now be conveniently accessed from anywhere in the world using the iPad. In addition to VS120 images, any images captured in or converted to the .vsi file format, including images from cellSens software, are uploadable for remote viewing on an iPad. With a click, tap or finger pinch, users can verify, select, pan, zoom and observe their virtual images at different magnifications. The mobile app makes the most of both the familiar user-friendliness and portability of the iPad, combined with the high image quality of the Olympus VS120 system to provide an insightful user experience. Users who download the free app will also have access to a library of high quality virtual slide images that can be used for demonstration or educational purposes. The modular Olympus VS120 virtual slide system creates high-resolution digital images of complete microscope specimens that can be stored on a server for simultaneous remote viewing, at a range of magnifications. The system is optimised to provide high brightfield and fluorescence performance, combined with precise colour rendition and scanning.